Saturday, February 16 -- Rain, rain, go away. Come again another day. We've had more than our share of rain and snow on this trip. But I really can't complain. Even here in the Pacific Northwest we need the moisture and snow pack to get us through our long, hot summers. 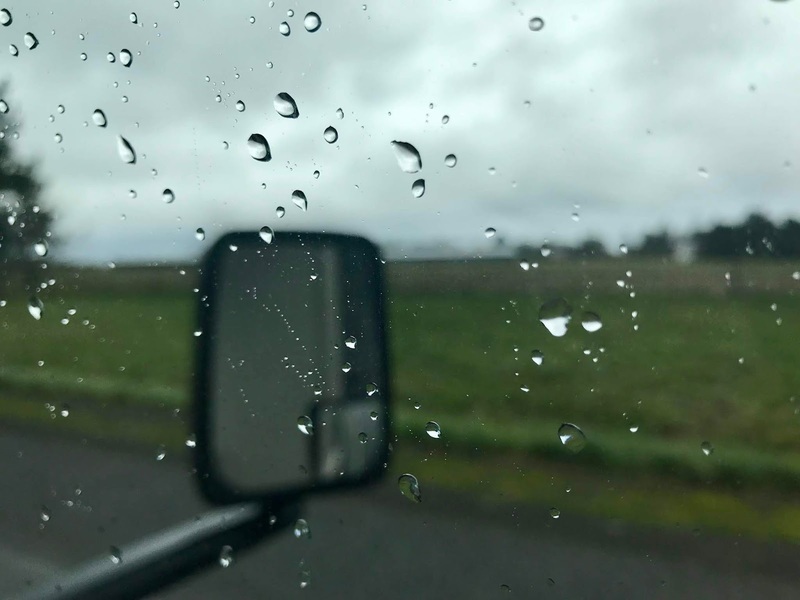 Green Oregon through a wet window. We left the Corvallis KOA early. 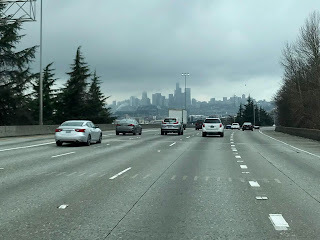 To get back to Bellingham, we have to go through two big cities. The first is Portland, Oregon. We've planned our travel times to do our big city driving on weekends when traffic is light. 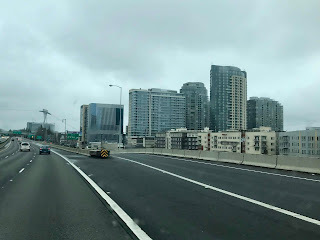 Approaching downtown Portland on I-5. 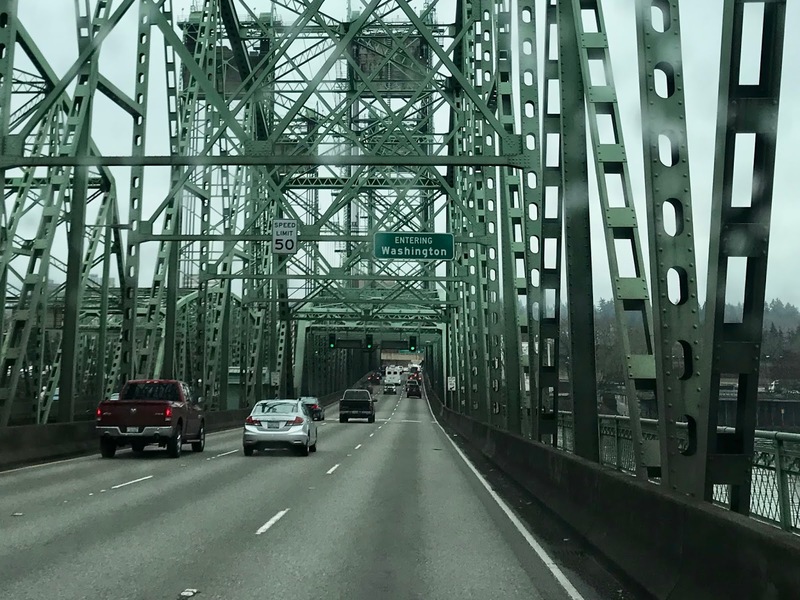 Crossing the Columbia River, we were welcomed back to Washington State. Today is a short 215 mile travel day. Our planned destination was the Washington Land Yacht Harbor RV park. 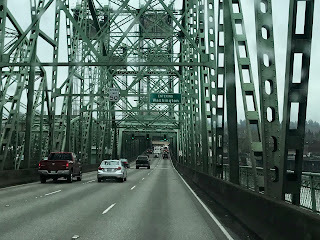 Entering Washington in a unique way on I-5. I called from our gas and Denny's breakfast stop in Chehalis, Washington, but no one answered. We checked it out anyway. It will be a place to stay when GNAC college basketball finals are held at St. Martin's University in Lacey. Wayne got a different idea about where to stay for the night. Not too far up the road is McChord Air Force Base. With our military IDs, we could stay at the Holiday Park on base. It's a lovely forested campground with the added benefit of being right next to the runway. 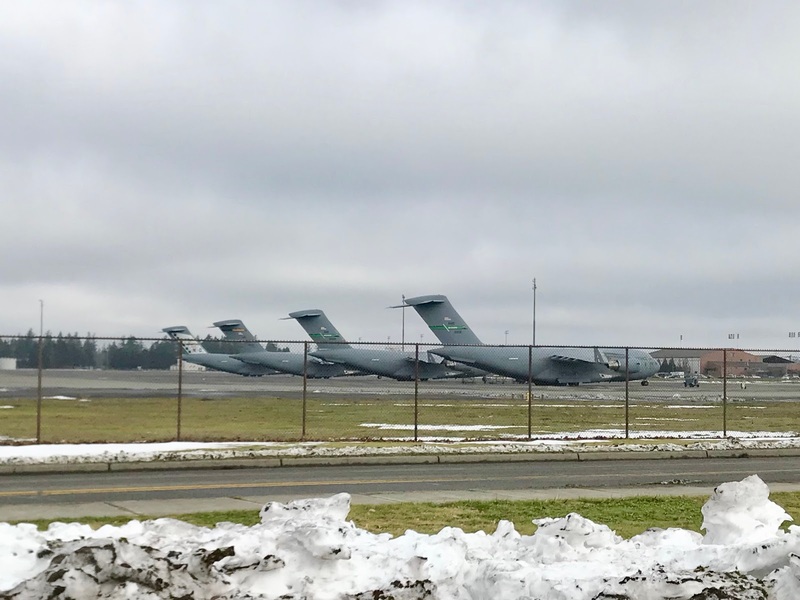 Sunday, February 17 -- McChord is a C-17 Globemaster III base. We didn't hear many flying on Sunday evening, so we drove over to the flightline this morning. 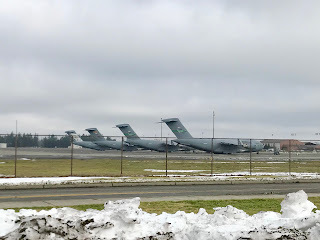 C-17s on the flightline at McChord AFB. C-17s are jet powered cargo aircraft that can fly anywhere in the world. Wayne's love of airplanes, especially military ones, made this campground #1 on his list and I know we will be returning, RV or not. A foggy and rainy entry into Seattle. Today's trip was another short one, only 130 miles. It was also a sad one. We've come full circle. 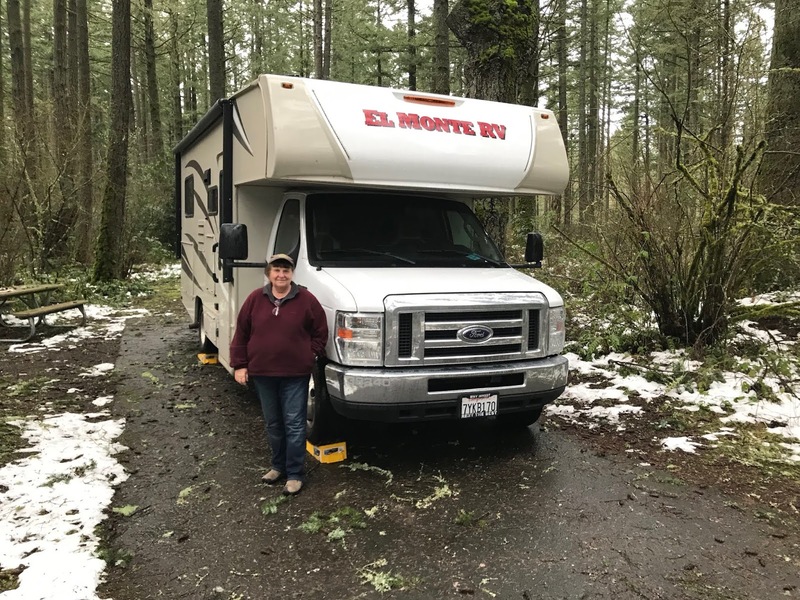 We started at El Monte RV in Ferndale on January 25 and our first two nights were at the Bellingham RV Park to get settled into our rig. 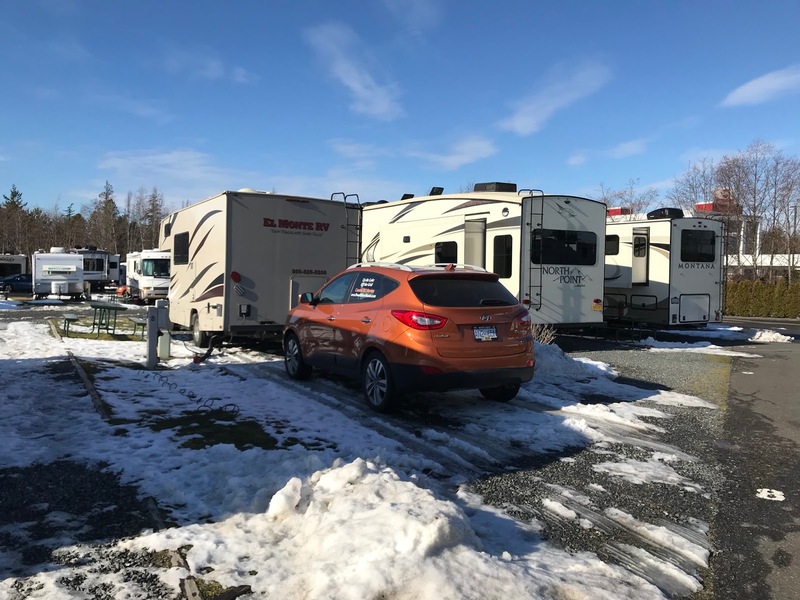 Back at the Bellingham RV Park, this time with snow. On the way into town we stopped at our condo to offload as much as we could. Then we returned to the Bellingham RV Park to deconfigure our rental RV. We brought our SUV to the park to complete the offload and return our home on wheels to El Monte RV in Ferndale in the morning. Thanks for posting so many interesting details of your trip. I enjoyed it! It was lovely sharing your trip with you. Have you been bitten by the RV bug? I don't think I could do this! I'm not good with adventures. With hubby's back issues, and dietary issues, and my anxiety and depression, I couldn't handle it! I am happy to share yours! Looks like you are having a great roadtrip. Have a great week! I just caught up on your whole trip and enjoyed traveling vicariously. I’m so glad you enjoyed the trip! Brought back lots of mrmories as we’ve stayed in many of the places you did. We loved full time RVing, (in a much larger one, since it was our only home for over ten years)...now we Camp in a Class B RoadTrek..,smaller than what you rented. I love it too. Hello, sounds like a wonderful experience. I would love to try it for a short time to see how it feels to live in an RV and travel. Thanks for sharing your trip! Enjoy your day, have a great weekend ahead! I have just caught up with your Travel log and thoroughly enjoyed travelling with you in your RV. The weather is so different to when we travel here in our winter but you can't stay home because of the weather and you have enjoyed your trip despite some challenging weather. Thanks for your blog.